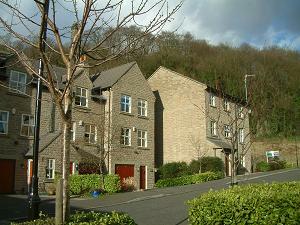 Built on the site of Oak Bank Mill, a cloth printing mill, this cul de sac contains a group of three storey apartment buildings built under the tree covered Beeston quarry escarpment. Approach off the roundabout at the junction of Palmerston Street, Church Street, Ingersley Road and Shrigley Road. Footway connection with Queen Street, Pool Bank and Palmerston Street. Nearest pubs – The Turners, Cotton Tree, Church House, Spinner’s Arms. Restaurants in Palmerston and High streets. There is pedestrian access to Queen Street and, via Pool Bank car park, to Palmerston Street and the shops. There is a lot of open space on the site and there is a reason for this – close to the start of the street the Harrop brook goes into a culvert. It passes right through the site and reappears beside Defiance Mill in Queen Street. Oak Bank mill was built over the river but Environment Agency standards now prohibit building over or within some distance of a river or culvert of this kind. Hamson Drive is named after Joseph Hamson who lived at the bottom of Shrigley Road from where he started his plumbing and decorating business in 1806. His descendants lived in the town until the early 21stC.